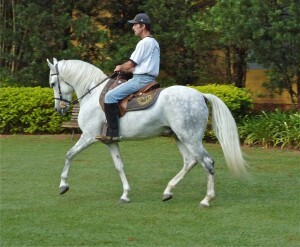 The 2012 Mangalarga Marchador clinic will be held at the Florida Horse Park in Ocala FL. We are providing lunch, dinners and a cocktail party for an all-inclusive price. $200 Audit 3 days, no riding; all meals included. One day non-riding audit attendance will also be available to the general public and USMMA members for a nominal fee. Friday: SELA DE OURO - 16 mile ride (everyone is encouraged to do part or all of the ride). Saturday: CLASSROOM and ARENA WORK Evaluation of your MM horses conformation and gait. Instruction on conformation and gait and how to improve your horse's gait. Instructors: ABCCMM (Brazilian MM association) professionals Tiago de Resende Garcia and Kate Moura da Costa Barcelos, both licensed veterinarians and judges in Brazil. Tiago is the ABCCMM Director of the ENA - the National School of Judges. The ENA's objective is to train MM judges on how to evaluate conformation, gait and functionality of the MM breed. Tiago and his team judge every sanctioned ABCCMM show in Brazil. Tiago has hosted symposiums and lectures to enlighten and inform MM breeders. Kate is an ABCCMM inspector (the 1st woman) and education program director. Kate was the instructor of our 2011 MM clinic. An accomplished rider, competitor and instructor, Kate was the #2 dressage rider in South America and now uses classical dressage in preparing and training Marchador horses for many farms in Brazil. Food: Dinners are planned at the Horse and Hound restaurant and a traditional Brazilian steakhouse, the Ipanema. Lunch will be served at the Florida Horse Park. Continental breakfast is included at most hotels in the area. Lodging: Sleep Inn and Suites $69 per night for 2 double beds or a king. Rooms have a microwave and refrigerator. Pool. There are also several other lodging choices in the close proximity to the Florida Horse Park. The Facility: The Florida Horse Park is a 500 acre park that offers many amenities like 156 stalls, several grass arenas, dressage arenas, cross country jumps, polo fields and miles of trails for trail or endurance riding. There are camping hookups here too. More learning or demos: We may also have special guests or performances by notable speakers from the equine world in the Ocala area on natural horsemanship, barefoot trimming, and working equitation and dressage for the gaited horse. As time permits in the schedule, we will let you know. TO CONNIE CLAIRE, CLINIC CHAIR. I am the USMMA member organizing the clinic. I attended the 2011 MM clinic and volunteered to have the next annual clinic in my hometown, Ocala, FL. I can use help! Please contact me to volunteer or to offer suggestions on how to make this a great event! Questions or suggestions? Please contact me too! 3 day Audit – Those persons who do not wish to ride. Participate fully, get your questions answered and learn more about the Marchador conformation and gait. Lunches and dinners included. 3 day Clinic Rider with Horse(s) – Those persons who will ride. Your pricing has been lowered to accommodate the extra expenses of bringing and boarding your horse. Please let us know if you will let other participants use your horse(s). Participate fully, get your questions answered and learn more about YOUR Marchador’s conformation and gait. Lunches and dinners included. 3 day Clinic Rider – Those persons who will ride, but who will use another member’s horse for the clinic. Participate fully, get your questions answered and learn more about the Marchador’s conformation and gait. Lunches and dinners included. 1 day Audit Non-members are invited to join us to meet the Marchador and learn more about the breed. Please indicate what day(s) you plan to attend. No food is provided. FLORIDA AGRICULTURE & HORSE PARK AUTHORITY, INC.
I/we understand that horseback riding and related activities, such as eventing and jumping, are very dangerous and involve the risk of serious injury and/or death, and/or property damage, including injury and/or death to horses, spectators and others. Accordingly, I/we agree that any activity engaged in by me on the premises owned by the state of Florida, or related to horses or horseback riding, if on the premises, is done at my own risk. Accordingly, I/we release and agree to hold harmless the state of Florida, the Florida Agriculture & Horse Park Authority along with it’s board of directors and employees, and any and all persons or entities who are guarantors or indemnitors of the above, all agents, employees, promotors, sponsors, other horse riders, horse owners, advertisers, sales persons, photographers, volunteers, (hereinafter called Releasees) from all liability for negligence or otherwise. I/we assume full responsibility for the risk of bodily injury, illness, death of myself and/or my horse(s) and any property damage due to the negligence of Releasees or otherwise while the premises owned by the state of Florida, the Florida Agriculture & Horse Park Authority along with its board of directors and employees or heavily engaged in horseback riding related activities, and/or while training, riding, competing, officiating, observing, volunteering, teaching, boarding, working for, or for any purpose relating to horseback riding, eventing or participating as rider or spectator in such activities. I/we agree not to sue any Releasees, and I/we release and agree to indemnity for the Releasees from and for all liability for the undersigned, his/her person, representatives, assignees, heirs, and demands therefore on account of injury to her person or property, or death of undersigned whether caused by the negligence of the Releasees or otherwise. I/we agree that this release, waiver and indemnity agreement is intended to be as broad and inclusive as is permitted by the law of this state where these activities are conducted, and if any part hereof is held invalid, it is agreed that the balance shall continue of full force and effect. I/we have read and voluntarily signed the release and waiver of liability and indemnity agreement and further agree that no oral representations, statements or inducements apart from the foregoing written agreements have been made nor shall be made except by a written and signed addendum. WARNING- Under Florida law, an equine activity sponsor or equine professional is not liable for an injury to or the death of, a participant in equine activities resulting from the inherent risks of equine activities. I HAVE READ THIS ENTIRE RELEASE AND AGREE TO ITS CONTENTS.